Even though dinosaurs lived millions of years ago, and now, all we have left of them are fossils, they made a clear mark on the ever-growing world of pop-culture. Thanks to the cult-classic Jurassic Park movies, these giant reptiles were brought to life and for the first time in the history we could experience their imposing presence from a much closer perspective. The vision of bringing dinosaurs to life in reality remains, however, purely between the pages of fictional stories. Due to the limits of the today’s science, there is barely a chance of seeing these monstrous creatures walk amongst us anytime soon. There is, however, a “what if” question. What if there would be a way of restoring dinosaurs’ DNA and hatching one of them in one of the world’s best laboratories? That would be amazing, wouldn’t it? Let me show you a brand new mobile game in which this vision comes true. In Infinite Dreams’ new game Crazy Dino Park, you have a chance not only of raising your own dinosaur, but also, as the name suggests, creating and managing an entire dino park! Crazy Dino Park is a strategy game maintained in a cartoonish graphic style, in which you become a manager of a dinosaur park and a coordinator of the dinosaur excavation group. Your job is to manage the park and make its visitors happy by surprising them with new species of dinosaurs you bring back to life. To do so, you have to depart on excavation trips where you collect fossils of the long-dead dinosaurs and other prehistoric creatures. Once you manage to collect an entire skeleton of a dinosaur specie, you can bring it back to life and place its living representative in your dino park for the people to see. 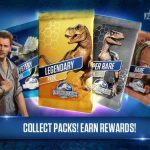 In the game you will also have to learn how to keep the income flowing to purchase new upgrades for your park and evolve your dinosaur species. This job, however, can be problematic for those new in the game. Thankfully, there is a Crazy Dino Park beginner’s guide for you, which will help you take first steps in the game. 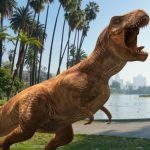 If you want to become a successful dinosaur park manager, feel free to read on and learn some of the most useful tips and tricks! In Crazy Dino Park, if you want to bring many forgotten species back to life, you have to venture on excavation sites and collect dinosaur fossils. If you want to be successful in your endeavours, there are some things you want to remember of when digging out dinosaur bones from the ground. Each excavation trip costs you a certain amount of money, so you have to plan your trips carefully in order not to end up with little or no funds at all left in your pocket. As you already know, to revive a long-dead dinosaur, you have to collect all the bones belonging to a particular specie. Sometimes, in order to assemble a skeleton of a prehistoric creature, you will have to visit the excavation site more than once, and that will require from you even more money. Best idea is to focus on these dinosaur skeletons that are the easiest for you to complete in a relatively short period of time and with little effort. By planning your excavation trips with regards to your needs and resources you will save a lot of money, since you will simply focus on these sites that have the highest chance to “drop” the bones you currently need. Sometimes, dinosaur bones will appear under the rocks. In order to reach them, you will have to use your pickaxes to break the rocks and unravel the missing bones. Remember that you have only 3 pickaxes per trip at your disposal, so you have to break only these rocks that provide you with the highest possibility of uncovering dinosaur bones. But how to spot the right rocks? On the excavation sites, not every rock consists of a single boulder, but there are also entire clusters of rocks. If you look closely, in the gaps between the boulders, you will be able to spot fragments of bones beneath the rocks. If you will pay attention to this little detail, it will save you a lot of resources and precious time that you can spend otherwise. Just like there is a trick regarding the rocks, there is also one concerning the bones. Well, how should I put it… some of the bones are fake. Knowing how to distinguish them from the right ones will certainly help you save your pickaxes on the excavation sites. The way of telling the right bones from the fake ones is that the right bones are the ones that have sharp edges, whereas the fake ones are a little rounded on the sides. Even though you have only 3 pickaxes per trip, you can easily “recharge” them, either by purchasing another set of 3 pickaxes per 1 gem or by watching an advertising 30s-long video. I would honestly recommend the second option, since you will need gems for other and much more important purposes. Remember, however, that you have a limited number of ad watching possibilities, so you shouldn’t rely on the refilling option that much, but rather focus on doing your best to spot the right bones naturally. There will be cases in which you will not be able to collect all the bones and you will have to revisit the excavation site to finish off a dinosaur skeleton you are working on. It’s always good to get as much profit as you can from each excavation trip, so if you realise that in no way you are capable of getting all the bones, make sure to break random rocks for additional gold coins, gems or special items that may be hidden inside of them. The same applies to the situation in which you have completed the task and you have some of the pickaxes left. By remembering these hints, you will maximize your chances on collecting bones, gold coins, gems and special items hidden on the excavation sites. Planning your excavation trips is but a one of the many things that you want to take care of when playing Crazy Dino Park. Once you will manage to combine all the bones together and bring a specie back to life, you will have to turn your eyes to your park. It’s time for some management job! Let’s make things clear: the main goal of the game is to bring more dinos to your park, and for that you need to organise more excavation trips. Now, in order to depart on new journeys you need gold coins, and these you can get once your park gains more popularity points marked by white thumbs on the top-left corner of the screen. There are several ways and places from which you can get gold coins, such as selling tickets at the Ticket Booth. People love food, so you should also invest in a Hot-Dog stand and collect coins from there. Once you will reach level 10, you will be able to unlock a dino arena where you can challenge other dinos to fight your own. At the beginning of the game you will have only 1 tournament in which you will be able to participate, but the more successful you will be, the more advanced tournaments you will unlock. You can get several hundreds of gold coins per tournament, so it’s a good way of farming money on the regular basis. At this point it’s also important to learn of how the fighting between dinosaurs actually happens. The battles between dinosaurs are played in turns and all you will have to do is to tap on your device screen whenever a battle bar turns green. In such a way, you will deal the highest possible damage to your enemy. Remember, however, that once you are late with performing a blow, your attack will most likely fail and you will simply lose your chance for a hit. As you see, it is important to tap the screen in a very short time span. What is more, if you happen to be super accurate (and lucky) you will be capable of performing a super blow which instantly knocks down your opponent. Each of your dinosaurs also has statistics that you want to take note of. Two crossed swords indicate the power with which your dinosaur strikes, red heart represents hit points and a running man shows how fast your dino will attack. Before the battle begins you will have some time to choose your fighters and assemble them on the ring, so make sure to keep the stats in mind and choose your dinos wisely! Another mean of getting gold are expeditions on which you can send your archeologists. To organise one, you need a special facility where you will plan your ventures. Once you will send your people to a desired place on an expedition map, it will take some time (actually hours) before he will return with the reward. It’s good to regularly invest in the expeditions, since they provide you not only with additional gold coins, but also with dinosaur bones, special items and gems. Remember to always make your archeologists busy for a regular income! Apart from the income involving your park facilities, the first thing to do in your park is breaking all the breakable rocks in the area. They are easy to spot because they are of the brown colour. Also, remember that at the beginning of the game, one of the breakable rocks in your park have a hidden gold mine which should provide you with several hundreds of gold coins – a very useful boost especially when you are on the verge of bankruptcy, so it’s wise to save it for the tough times. Sometimes, the visitors will also drop their coins on the ground for you to collect. People pay for what they like, so the more they are content with your park’s attractions, the more they will pay you. The easiest way to collect their money is to swipe your screen from one dino pen to another, hoping that some of your visitors will like what they see. Usually they will drop small coins on the ground which count as several gold coins. Sometimes, however, if they will like something very much, they will drop the big ones which count as 50 gold coins. Make sure to click on them fast because they won’t be there forever! There is also a trick to pull many visitors to a dino pen of your choice. Just keep tapping one of your dinosaurs and make it jump in the spot. By doing so, you will attract your visitors to that creature and that will increase your chances of getting additional money. The main way of getting new dinos, as said, is by collecting dino fossils. Only by completing an entire skeleton you will be able to revive a given specie. “Assembling” your dino from the scratch will usually take you some time, especially if we are talking about such advanced species as triceratops or stegosaurus which skeletons contain of four different bone types. Each excavation trip costs a certain amount of money, so you will have to plan your endeavours carefully not end up completely without funds. It’s best to focus on the skeletons that have been already partly assembled, so at least you will have some goals to follow. Apart from getting new species by simply collecting the bones of dinosaurs and bringing them back to life is by hatching them from an egg or evolving your low-tiered dinos into a high-tiered one. You can get dinosaur eggs during your excavation trips. Once you get one, make sure to place it in an incubator and wait from several minutes to several hours until your dinosaur will hatch. Of course, you don’t literally have to wait and watch your dino grow, since Crazy Dino Park is an idle game which collects the money and counts the time even if you are not present in the game. You can also speed up the process of hatching by spending a requested amount of gems. Once your dino will hatch, it will be automatically moved to one of the existing dino pens or a new one if it’s a new specie. Another important feature in Crazy Dino Park that you want to remember about is the possibility of evolving your dinosaurs. You can upgrade your dinos by combining two creatures of the same specie and the same tier. There are 6 tiers you can get your dinos to. 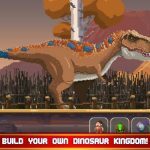 The point of upgrading your dinos is twofold: to make them stronger on the arena and to attract more people to your park and, in the process, gain more gold coins since people enjoy seeing different species. Also, the stronger your dinos are, the more possible it will be for them to withstand the blows of the enemy dinos and for you to win tournaments. The profit of getting more gold coins, well… I don’t really have to explain you that, do I? You can evolve your dinos by dragging one specie representative on top of another and they will combine into a creature of a tier higher than their precursors. Make sure to be at the pen when it happens, since I can guarantee you that the visitors of your park will go crazy and shower you with their money in reward for having a chance to witness that spectacular event! Oh, and don’t forget that every new specie requires a special pen where it will grow, and building one, of course, takes some time. You can also decide to speed the building process, but it will cost you some gems. To experience a real progress in the game, you will also have to remember about completing objectives. Only that way you will be able to level up, unlock new places on the excavation map and get rare purple gems as a reward. Usually, you will have to do such tasks as upgrading a certain specie to a particular level or raising a number of dinosaurs. At the beginning of the game, you don’t really have to bother that much with following the objective panel, since I can guarantee you that you will complete most of them without even tracking your progress. In the later stages of the game, however, it’s good to keep your tasks in mind to know what to aim for (and save your money for). Once you will manage to complete a set of tasks, your excavation map will be updated and you will get new destinations with new dinosaur species waiting to be explored and digged out. Remember that the further you advance on the map, the more expensive your excavation trips will become. 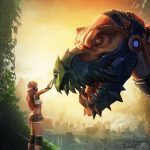 Crazy Dino Park is a fun game that perfectly fits young and adult players alike because of its appealing, cartoon-like graphics and a rather easy mechanics. However, it also requires from you a certain dose of a strategic approach in managing your park, an ability to plan your excavation trips and send your men on expeditions in order to reap the benefit. Also, as you can guess, a lot depends on the sheer luck, but if you will decide to follow some of the these tips you can increase your chances for success to maximum. And this ends our Crazy Dino Park beginner’s guide! Good luck with managing your park, and, if you happen to have additional helpful tips or tricks for the game, feel free to share them in the comment section below! What does the glowing dinosaurs do? The glowing Dinosaur is “legendary”. So he is a little bit stronger, than the normal. You can only evolve it with an other glowing one. I think this is some kind of annoying, because it took a space in your dinosaur habit and you need a lot of those special dinosaurs to combine them to the max. Doesn’t take up a space in the habitat. Hello! Does anyone know where is the store that I can get my piggy bank broken? What are the things in the top right corner of the dino pens? Does anyone know what the “interesting items” ( such as the tyres and the nails) do? Are they needed for later game or just pointless until further updates? Does anyone know why my ice-type dinos (mammoth for example) didn’t get an ice habitat? Does anyone know why does the poop after making it bigger and bigger does it eventually go small with eyes? Does anyone know how I can upgrade the ticket booth ? I need 7000 coins to upgrade, while at this moment it can only hold 5050. Thank you ! Does anyone know what use the dynamite is? How do I make the Dino’s lay eggs? It has happened once, however, I’m not sure what I did. My dino laid an egg. It was a purple one. Dunno what I did to make it happen either. No it does not take up a space is your habitat. In most of the cases they are just wandering out of the habitats. Eventually they hide on trees, just showing eyes, legs, etc. That’s the tricky one. How can I upgrade my safe? thank you. Which level is max for ticket booth? What is the speed good for and what does it affect, when fighting in the arena?